When a corporate merger becomes a hostile takeover, a cutthroat businessman known only as the Suit must take down the competition before his company goes under. 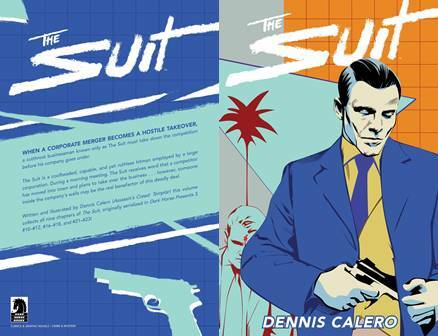 The Suit is a coolheaded, capable, and yet ruthless hitman employed by a large corporation. During a morning meeting, the Suit receives word that a competitor has moved into town and plans to take over the business . . . however, someone inside the company's walls may be the real benefactor of this deadly deal. Written and illustrated by Dennis Calero (Assassin's Creed: Templar) this volume collects all nine chapters of The Suit, originally serialized in Dark Horse Presents 3 #10-#12, #16-#18, and #21-#23!